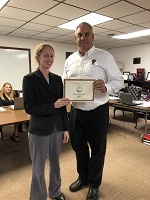 North Central Missouri College presented Maryellen Harman, History Instructor the NISOD Excellence Award at the September Board of Trustees meeting. Pictured is Maryellen Harman with President, Dr. Lenny Klaver. NISOD’s Excellence Awards recognize men and women each year who have demonstrated an outstanding commitment and contribution to their students and colleagues. In 1989, in connection with a University of Texas at Austin national study of teaching excellence, NISOD hosted its first ceremony honoring NISOD Excellence Award recipients. The response to that ceremony was so positive that NISOD began what has become the largest and most inspiring gathering that recognizes the contributions and achievements of community and technical college faculty, administrators, and staff (www.nisod.org).